The Open Bridges exhibition had its last day inside Scale Lane Bridge before we announce its next home. We were open every Saturday in January and February and welcomed 2000 visitors. We had a remarkable two months at the exhibition with lots of fascinating conversations with people who have grown up with the river and bridges central to their lives. We’ve heard many wonderful stories of life working on the barges and around the river over the years. The panel depicting the transcript of the conversations from ship to shore, bridge operators and event control on the night as the city was split in two has generated a lot of interest and discussion. The activity on board HMS Pickle as the 13 flares were fired into the sky tell of the excitement on the night. Thanks to everybody involved, Pete Curry and Bridges Operations, Andy Burton – City Manager, all the bridge staff and everybody who came to visit. 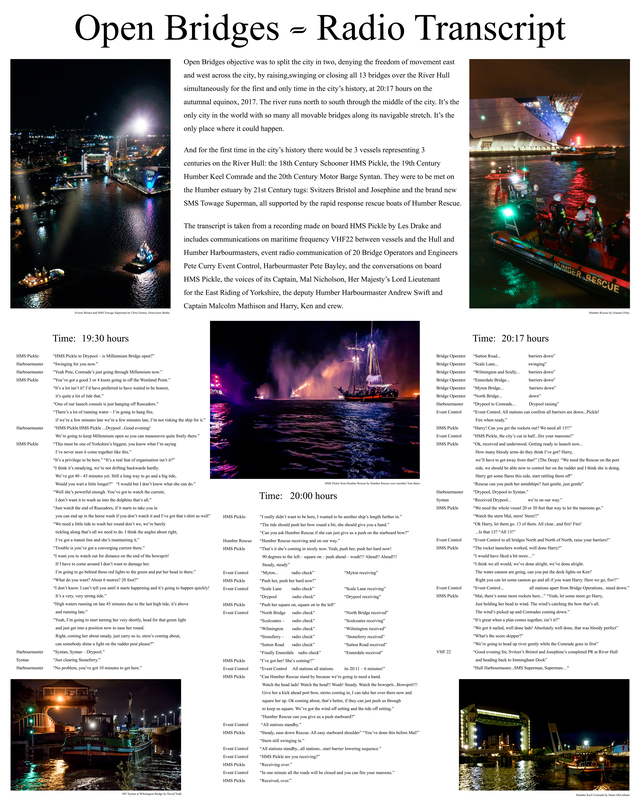 Open Bridges Hull: For the first time in the city’s history all 13 of Hull’s bridges raised, swung or closed simultaneously splitting the city in two at 20:17 hours on the autumnal equinox 2017 during Hull City of Culture’s Freedom Season.